I recently had another client conversation about optimizing their data warehouse and Business Intelligence (BI) environment. The client had lots of pride in their existing data warehouse and business intelligence accomplishments, and rightfully so. The heart of the conversation was about taking costs out of their reporting environments by consolidating runaway data marts and “spreadmarts,” and improving business analyst BI self-sufficiency. Instead of reporting on delayed deliveries, how about preventing delayed deliveries? Instead of reporting on spoilage, how about preventing spoilage? Instead of reporting on the number of students dropping out of your college, how about preventing students from dropping out? Instead of reporting on product failures, how about preventing product failures? In order to prevent, we first need to predict. And if I can predict, then I can prescribe. Now this is thinking like a data scientist! We did a project for a hospital to predict which patients are likely to catch a staph infection (what hospitals call Hospital Acquired Infections or HAI). Staph infections are costly to hospitals due to increased levels of care plus the potential financial and legal liabilities if a patient becomes sick or dies from the staph infection. In order to meet the business use case of “Reducing HAI Infections,” we created a “HAI Score” for every patient (based upon personal data such as their health care history, demographics, current health readings, and family health history; diet, coupled with clustering of “similar” patient situations). Think of it as a FICO score that measures the likelihood of catching a Hospital Acquired Infection while in the hospital. We used the HAI score to identify patients that we felt had an abnormally high chance of catching a staph infection based upon their current HAI score plus the types of care that they were likely to receive while in the hospital (for example, requiring a catheter was always an area of concern). If we could predict that a patient had an abnormally high HAI score, then we could prescribe relevant levels of care such as having the patient spend an extra day in the hospital, a regiment of follow up calls to make sure that the patent was taking their medications, and cleaning their wound areas or more frequently doctor check up visit. The best way to reduce operating and business costs and risks is to prevent them! And that concept can apply across a multitude of use cases. Online returns are a big issue in the rapidly growing world of eCommerce. In 2016, e-retail sales accounted for 8.7 percent of all retail sales worldwide. This figure is expected to reach 15.5 percent in 2021. 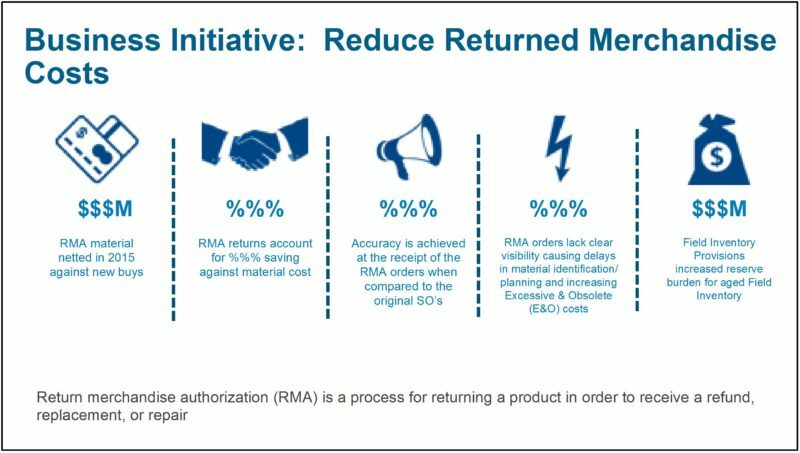 For example, one client with whom I am working is trying to reduce RMA’s or Returned Merchandise Authorizations. The potential cost and risk savings are staggering (note: the details on the business initiative have been scrubbed with the client’s blessing). I think this approach would allow us to “reduce returns” by taking preventive actions to predict the likelihood of product returns so that we can prescribe preventative actions or decisions. A spreadmart (spreadsheet data mart) is a business data analysis system running on spreadsheets or other desktop databases that is created and maintained by individuals or groups to perform the tasks normally done by a data mart or data warehouse.